This week marks the last of the school year for my girls and I’m picturing nothing but sunny days ahead. 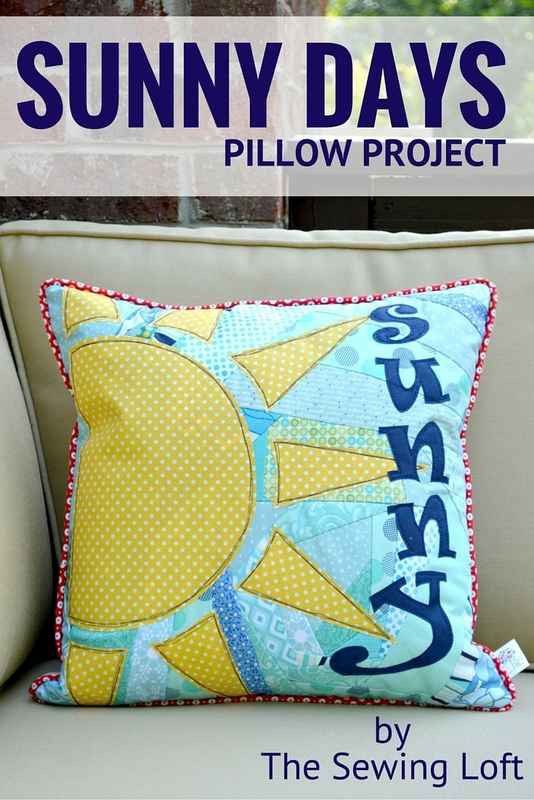 To help celebrate how lucky they are I made a fun new pillow cover; Sunny Days Pillow. 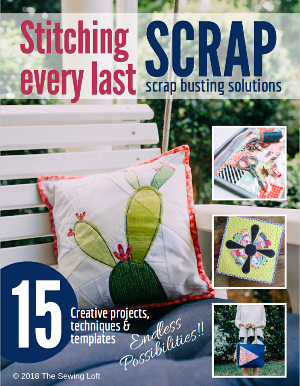 Not only is this project a complete scrap buster but the bright, cheery outlook just makes me smile. 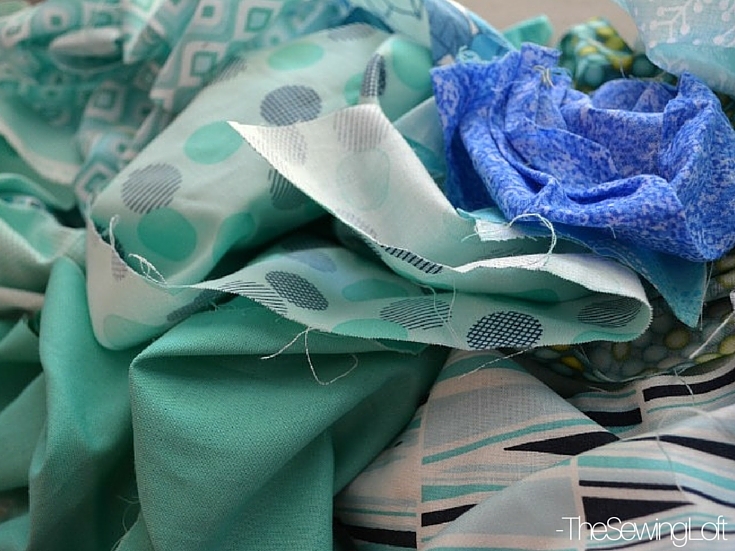 I pulled out every scrap piece of blue fabric I had in my stash. Start with pre pressed scrap pieces of fabric. Cut a 17″ x 17″ square of batting. Create your fabric sandwich like so: layer of batting and then your 1st scrap positioned in place right side up. The 1st layer of scrap fabric should be an odd shape created from straight lines and can even be a little off kilter. 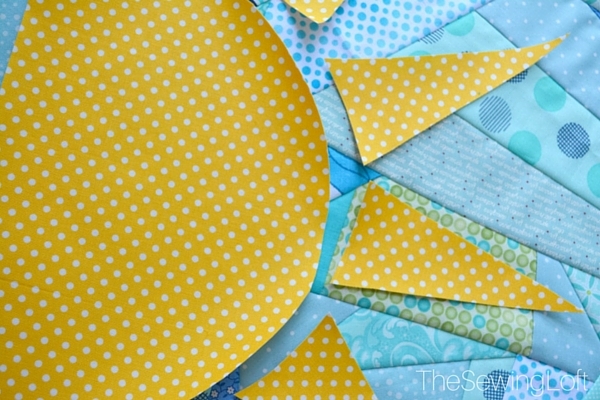 Place and pin the scrap towards the upper corner of the square; right side or pretty side up. All around machine stitch fabric scrap in place. 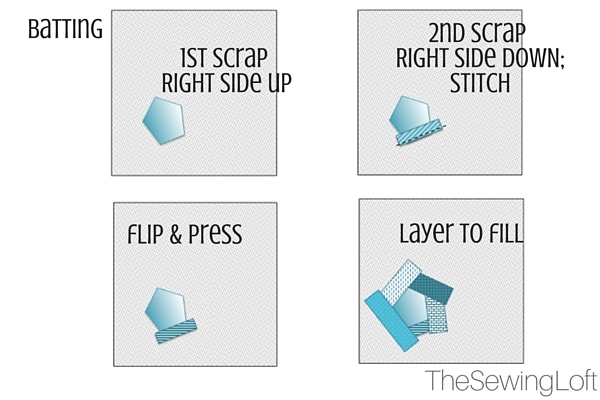 Trim away excess fabric only after you have flipped and pressed your scrap in place. Combining fun prints in the same color value will create amazing background. Once the batting is covered, it’s time to draw the design. Have no fear, this took no artistic skill just a standard plate from my kitchen and pencil! 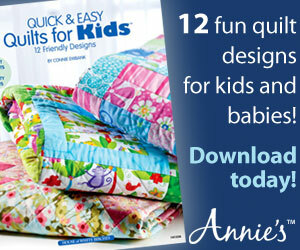 Grab a plate from the kitchen, a pencil and the double sided fusible. Lay the plate on the fusible and trace. Then draw several long triangles to make the rays. Fuse to fabric following the manufacturer’s instructions. Position and fuse to your pillow front as you like. To allow for extra room I placed mine to the left. 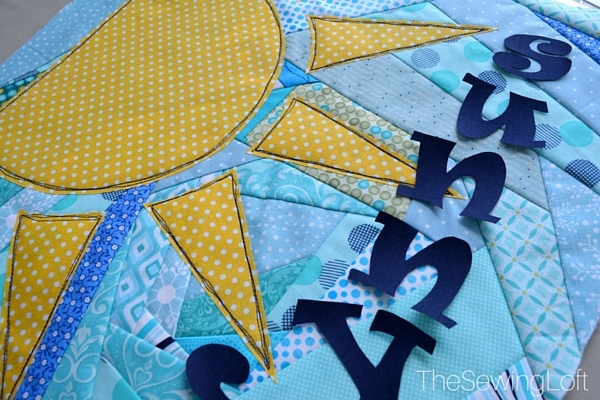 I repeated the process to create the word SUNNY using my funky applique template. 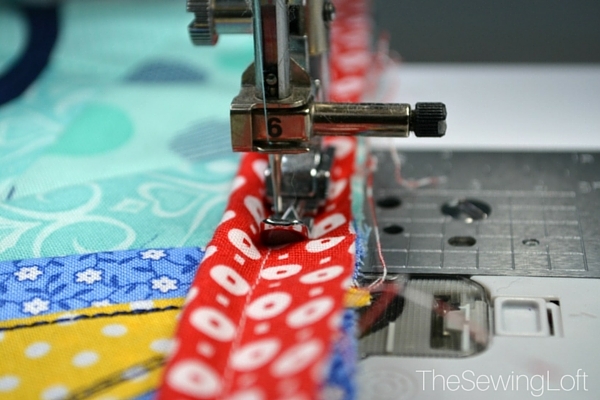 Using a contrast thread; add an outlining stitch around the edge of each applique piece. To add extra texture, I used rayon navy thread with free motion embroidery. 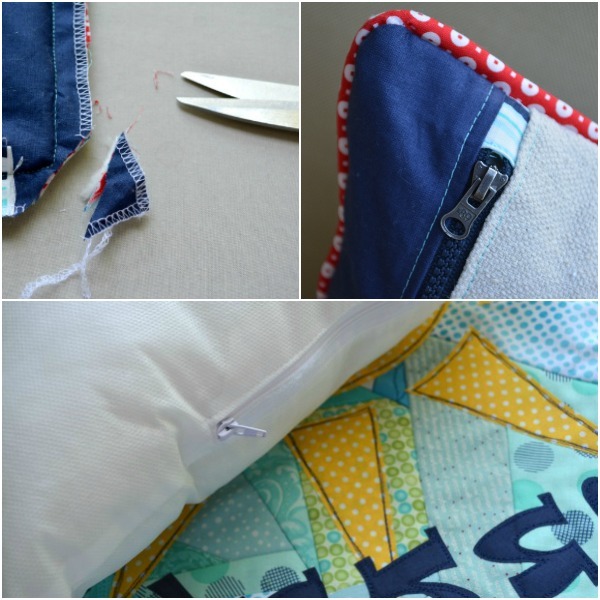 Trim your pillow front down to size once everything is fused and stitched in place. Mine measures 16 1/2″ since my pillow form is 16″ square. This allows for seam allowance and a nice snug fit of the form. Repeat with pillow backing fabric. Using my narrow zipper foot and cording, I created and attached custom red piping for a splash of color. The sunny day pillow is so cute! I am in the process of making a wedding dress for a friend, so I will be looking at your rolled hem and zipper articles!